We invoke the Divine Energy of the Goddess in all her forms, to preseve happiness, awareness, peace, love, and nourshment. 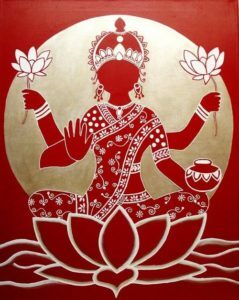 In Sanskrit, the word, Lakshmi” is dervied from the root, lakme, which ,means “goal”, implying that we must be clear with our intent to live a rich life of knowldge, that is continually maturing through undersatanding and compassion. The four arms of the Goddess represent the four directions in space and thus symbolize omnipresence and omnipotence of the Goddess. The red color syinbolizes activity. The golden embroidery on red dress symbolizes prosperity, both material and spiritual. The idea conveyed here is that the Goddess is generous in her powers to give wealth, familial and communal wholeness to the spiritual aspirant. The lotus seat, which Lakshmi is standing upon, signifies that while living in this world, one should live in sadhana, enjoy its wealth and not become attached to it. Sadhana living is analogous to a lotus that grows in water but is not wetted by water.